CAP Talk | General Discussion | Uniforms & Awards | Topic: Looking for Aviator shirts? I got u, fam! Looking for Aviator shirts? I got u, fam! Sent this to my seniors this weekend, figured I'd follow it up here. Size 16, $9.00 with free shipping is a steal. The same seller has shirts up to size 18. 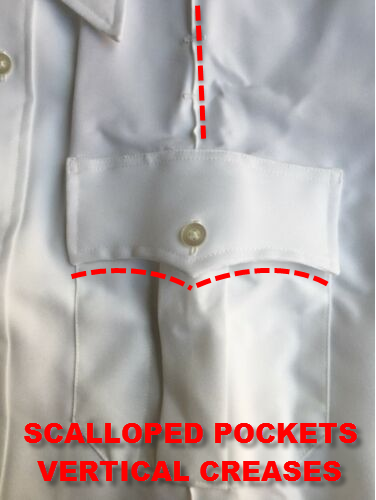 I would caution: watch out when looking at aviator shirts, as many "aviator" shirts are actually law enforcement shirts and have different pocket designs. 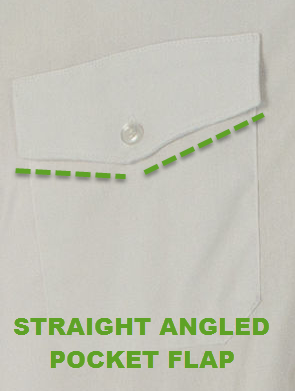 The two kinds of pockets that are OK for CAP wear are shown below: angled and mitered. The law enforcement/EMS versions of these shirts have scalloped pockets and the sewn-in vertical creases as pictured below. Those are a no-go for CAP wear. Also, and this is just my personal preference: Van Heusen shirts, especially the "poplin" ones, are kind of thin and chintzy and "pill up" quickly. I've had very good luck with the "Flying Cross"-brand "Distinguished" line of shirts (they sell their blue shirts thru AAFES as the "premium" shirts..) These shirts have the mitered pockets just like the USAF blue shirt does. Their fabric is a little heavier, too. Note: I'm not related to the Ebay seller in any way, but when I come across these, I buy them. 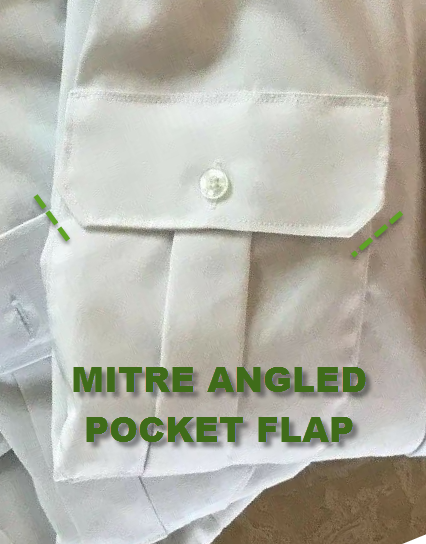 Also, and I forgot to mention this to my seniors: occasionally you'll get the nice white aviator shirt that has flapped pockets that are "false" and its actually an open topped pocket like a regular dress shirt. 5 minutes on a sewing machine with white thread fixes that up. Not that I know anybody who's gotten one of those or anything..
Re: Looking for Aviator shirts? I got u, fam! hey, as long as CAP is also the U.S. Air Force Auxiliary... why not pattern our corporate uniforms after those of the Air Force (even if not exactly the same in every way... at least try to parallel them in ways that are possible to do so. Way back when the aviator uniform was introduced, the shirt available from the Bookstore was the Van Heusen Aviator version. This one has straight angled, functional pocket flaps, no insignia eyelets, and no pocket pleats. I take it that this is the preferred configuration. Their Pilot House brand has never disappointed me in fit or design, and is similar to the Flying Cross brand described above. My only caveat to that whole thing is that I was pointing out to my seniors that pilot (aviator) shirts can be had cheaply in a variety of sources and configurations. There's a tendency to default to the polo shirt because its "cheap" (well, not really), when in reality that's not the minimum basic uniform, nor should it be. yes, you can get the silkscreened polo for for $27. Yes, you can get the regular embroidered polo for about $37 ($46 with customization), and the super-duper-tactical for about $48 ($57 with customization). But you can also get the "minimum basic uniform" with a $9 aviator shirt on ebay, and $9 for epaulets and $4 for a nametag. Now you're you're all in except pants for around $22. Even if you buy an aviator off the shelf on Amazon for $20-25, you're still all in for $33 to $38. A pretty inexpensive uniform, and the one that meets the requirements. I have made that point on a number of occasions - but as someone who wears w white (le style) shirt at work on a daily basis, I can tell you the actual issue here is maintenance. I have seen white shirts that have gone a dingy grey with time, and people show up at exercises with one that are "too stained to wear to regular meetings". The dark blue polo shirt needs no ironing, you can't put the insignia on it incorrectly, and most stains don't show. They actually have to be seriously deteriorated before its noticeable. The polo shirt is the uniform of, well, lazy people. The polo shirt is the uniform of, well, lazy people more concerned with doing the job than the dog and pony show. yes, you can get the silkscreened polo for for $27. That abomination of clothing needs to go. Silkscreen polos look cheap and do not last. Back to talking about aviator shirts. I just ordered an aviator shirt from https://acutaboveuniforms.com. They have a ton more options for fit (relaxed, taper, slim) and you can tailor the torso size even further. I'm a slim guy so most shirts fit like a bag on me and need to be taken in. (Terrible problem to have, I know.) Just passing this on in the even that anyone's in the same boat. I'll post on the quality when I get it. Price was around $30 depending on the type of material and cut. I think most seniors would prefer to have your "slim guy" problem. I take it that means you do not have the so-called "beer belly?" I have, but I do not drink. I guess I should call it a "rice-bread-cheese-soda belly." But most people will think "name's too long!" Ha! Don't get me wrong. it is a battle. Thankfully I'm still in government service and I'm required to keep the beer belly tame. I prefer to think of mine as high RCS (radar cross section). Guys like me may not wear ABUs/BDUs while carrying these CFTs... since their High RCS degrades the utility of conventional camouflage, necessitating the use of barrage/noise jamming to improve system effectiveness in a contested environment. Thus, the snowy white Gray/Whites with lots of shiny glinty wings/nameplates enable uniform spectral dominance in the CAP Airspace. (There... some of y'all can use that for an SOS or ACSC paper)! Spam, hiding behind a tree! See, aside from the fact that that's really funny, it also shows that we MUST reinvigorate the Army EW community. Y'all only think camocamocamo… and there are some things just too big to camouflage! With an electronic attack approach, you just wouldn't be able to see the tree at all, or anything else like Spam! So, blindingly white shirt jamming techniques, ON! I am 5' 11" and 196Lb. Within USAF limits, let alone CAP, and only 8lb out of US Army specs. I am within H/W for USAF uniforms, but I don't wear them. I look awful in blues and like a stuffed sausage in a flight suit. I'm 30 Lb overweight and I really look it. Yet according to Attachment 2 - no problem. Incidentally the aviator shirts are cut differently and I fit those just fine, provided I don't look in a mirror. Pretty much everybody in SoCal are wearing ones from the same place as they are only $14. Just make sure you get the EMT shirts and not the security guard shirts as the creases and pockets don't work for CAP.